Ink Printer Cartridges: Wide Selection Available at CTEC. At CTEC in Bloemfontein we stock compatible ink cartridges for most of the popular models of inkjet printers. We can supply the customer with genuine ink cartridges, but we mainly focus on generic ink cartridges and the refilling of ink cartridges. These options save the customer money, without compromising on quality. Using our inkjet cartridges, refilling your empty cartridges at our shop or even buying a refill kit, won’t damage your printer or void your warranty. We have years of experience in the ink and toner market and know how inkjet printers function. We therefore also know what problems may occur due to human error when using compatible ink cartridges and how easy it is to solve these problems. Our staff is always on-hand to give sound advice on which inkjet cartridge to buy for your specific needs. Ink Cartridges: How Do They Work? The statement that compatible, remanufactured or ink refills will damage your printer is a myth. To refute this statement one should firstly know how an ink cartridge works. Inkjet printers use ink cartridges (inkjet cartridges) that contain the ink that is deposited onto the paper during the printing process. Each cartridge contains one or more ink reservoirs. Most modern inkjet printers also have electronic contacts and a chip that communicates with the printer. Popular inkjet printers made by HP, Lexmark and Canon make use of a thermal inkjet. Inside the partition of the reservoir is a tiny metal plate or resistor which serves as a heating element. The printer gives a signal and a small current flow through the metal or resistor making it warm. The ink in contact with the heated resistor is vaporized into a tiny steam bubble inside the nozzle of the head. Through this process an ink droplet is forced out of the cartridge nozzle onto the paper. This process happens in a fraction of a millisecond. Epson ink cartridges make use of a piezoelectric crystal in each nozzle and don’t use a heating element. The crystal changes shape and size when a current is applied. This generates an increase in pressure in the ink channel, which forces a droplet of ink from the nozzle. Generally two types of crystals are used which include ones that stretch when subjected to electricity or bi-morphs which bend. The ink channels in a piezoelectric ink jet print head can be formed using quite a number of procedures, but one common method used include lamination of a stack of metal plates, each of which contains precision micro-fabricated features of various shapes (i.e. containing an ink channel, orifice, reservoir and crystal). The cool environmental conditions that are created permit the use of inks that perform badly when heated. These piezoelectric systems can also make smaller ink drops in some situations than their thermal inkjet counterparts. Common Ink Cartridge Problems and How to Solve Them? Inkjet printing relies on a smooth flow of ink. This printing process can be hindered if the ink starts to dry at the print head. This usually starts to happen when the levels of ink becomes low. When the printer head starts to clog, it is recommended to use distilled water and a lint-free cloth to clean the head of the inkjet cartridge. Distilled water is free of contaminants that may clog the print head. Other cleaning agents like Isopropyl alcohol will damage the printing head, melting the plastic at the connections and rubber gaskets. Ink also serves as a coolant for the metal-plate heating elements, so if the levels of ink run very low and printing is still attempted the heating elements in thermal cartridges often burn out, permanently damaging the print head. It is very important to rather refill the ink cartridge or replace it to avoid overheating damage to the print head. As you can see, most problems with inkjet cartridges are caused by human error. Whether it is original or compatible ink cartridges, one has to follow the indications provided to ensure that the ink cartridges are used correctly. If this is done there should be no reason why our quality compatible ink cartridges won’t work on your printer. Please read our blog where we will regularly provide information and tips on how to solve common problems with your inkjet printer and ink cartridges. So who is a reliable dealer? The answer to this is actually very easy. A reliable dealer is one with a proven track record. At CTEC we have an excellent track record of providing quality and effective ink cartridges at really competitive prices. We also have the experience to provide our clients with sound knowledge about the product. Our ink cartridges are guaranteed and therefore the customers are provided with not just a cost saving option, but also a stress free option. Our greatest asset is that we are conveniently located in Westdene in Bloemfontein. It is a safe business neighborhood in Bloemfontein and therefore we are close by to help our customers personally if problems arise with their ink cartridge purchase. CTEC is a trusted dealer in Bloemfontein when it comes to ink refills. We have been operating in Bloemfontein for a long time. If you visit our cartridge shop at 49 2nd Avenue Bloemfontein you can actually stand and watch while our technician fills your cartridge in our workshop. 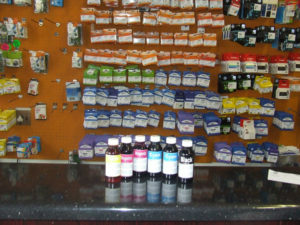 If you prefer to do it yourself you can also buy ink refill kits from us at competitive prices.